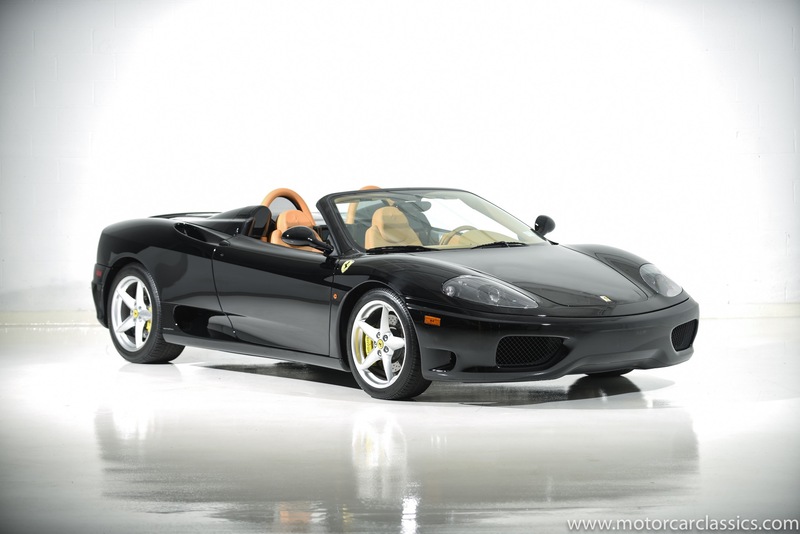 2003 FERRARI 360 SPIDER for sale. Motorcar Classics is proud to offer this 2003 360 Spider features in Nero Black with Tan interior with only 4,434 two-owner miles. This is the rare and now most desirable three-pedal 6-speed manual gearbox variant which makes it particularly collectible. Factory options include 6 CD Changer, Battery Charger, Power Daytona Style Seats, Front & Rear Challenge Grill, Scuderia Ferrari Shields, Yellow brake calipers, Full leather interior including roll bar, rear shelf, and doors,, HiFi Sound System, Colored Steering Wheel, and Colored Stitching. Additional upgrades include Tubi Exhaust and 3M Nose protection. The car is unblemished and as-new in all respects. The car retains its full complement of book and tools in their immaculate Schedoni leather cases. This Ferrari has been meticulously maintained and detailed. The paint is all factory original. The major service, including the timing belt, was done in our shop within the last six months. Drive and show with pride.